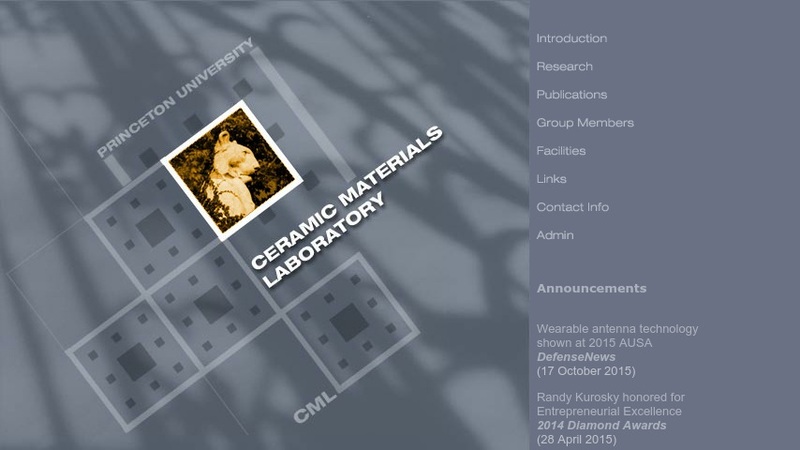 Princeton University's Ceramic Materials Laboratory conducts research on ceramic processing science and technology. It conducts basic and applied research to improve material systems with an emphasis on functionality and improved material performance. The introduction page describes the lab's work in terms of "bioinspired processing," a new paradigm in materials processing. Research projects address the areas of Biomimetics and Bioinspired Materials, Multifunctional Materials, as well as Nanoscale Science and Technology. Projects within each of these areas are described on the website. Many of the lab's publications, such as journal articles, conference proceedings, books, and patent information, are also posted online.